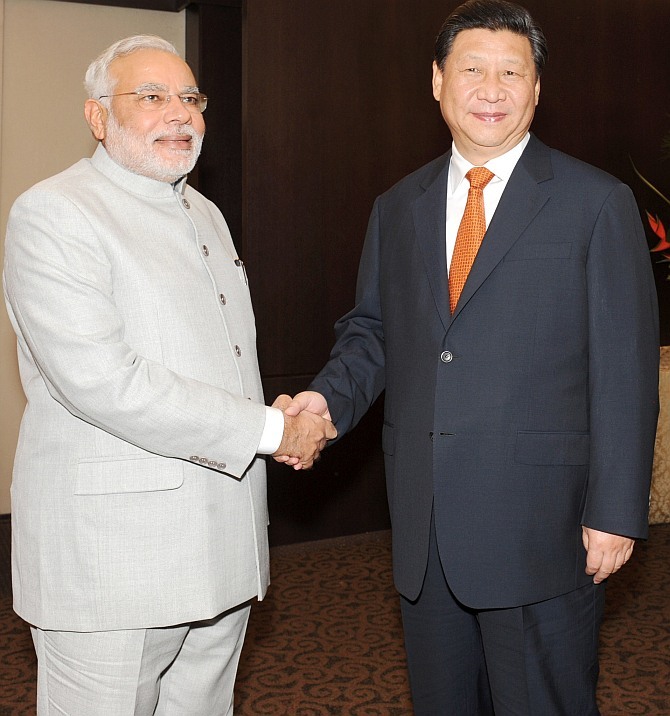 Rediff.com » News » Can India and China make a clean break with the past? Can India and China make a clean break with the past? Chinese President Xi Jinping’s visit to India is a time for the two countries to get away from the haze of rhetoric and stale euphoria, says Sana Hashmi. With the Modi-Xi summit this week, hopes are high for both countries to bring India-China relations on track. New Delhi is all geared up to welcome Chinese President Xi Jinping. In fact, India’s newly appointed National Security Advisor, Ajit Doval, visited Beijing for the preparatory meeting on September 9. Though Xi met Prime Minister Narendra Modi on the sidelines of the BRICS (Brazil, Russia, India, China and South Africa) summit in July, this is going to be their first official meeting at the bilateral level. Xi’s first state visit to India, in all probability, is considered to be a watershed event in India-China relations which have a history of mutual apprehensions. India has always been of utmost priority in China’s strategic calculations, which is by and large attributed to India’s strategic location and its burgeoning stature on the international fora. Chinese Premier Li Keqiang’s maiden visit to India in May 2013 was a case in point. However, the visit was overshadowed by the April-May 2013 Ladakh stand-off and nothing substantial was achieved. For instance, border talks did not figure prominently in (former prime minister) Manmohan Singh-Li Keqiang summit. Till now, China has always endeavoured to keep the India-China border issue on the backburner while engaging India in a dialogue that has always been in limbo. Xi’s forthcoming India visit is indicative of China’s changing stance towards India. With the change in government in India and Modi’s apparent moves of reinforcing ties with Japan, China is seeking to bridge the prevailing gap between the two biggest economies of Asia. This visit is also going to prove significant as due to the ongoing political imbroglio in Pakistan, Xi has cancelled his much-awaited visit to Pakistan which was scheduled to be held later this month. Modi was on a state visit to Japan in August-September 2014. This visit was highly successful in strengthening the bilateral strategic partnership. While during the visit, Japanese Prime Minister Shinzo Abe pledged to invest $35 billion in India’s infrastructure building in the next five years, there has been no significant investment from the Chinese side in the last few years. China is already entangled in a blow-hot blow-cold relationship with the major powers of the world, particularly Japan. Furthermore, its relations with Japan are going through a rough phase due to the ongoing dispute over the Senkaku islands. These geopolitical situations compel China to look towards India in a more amicable way. In such a situation, where China’s all-weather friend Pakistan is embroiled in political upheavals and India is inching closer to Japan, China is looking for ways to improve relations with India. The Indian side has to understand that China is not just a neighbour with expansionist policies and with which India has rhetorical problems. China is the world’s second largest economy with a formidable economy. Hence, there is immense potential for India to explore economic opportunities during Xi’s visit. One may note that there is a commonality of interests between India and China. Despite lingering apprehensions on their half-a-century old territorial dispute, India and China are advertently getting closer on multilateral forum such as G-20 and BRICS. However, there still exist a number of problems. Their strategic engagement is still non-existent and the huge trade imbalance seems to be a never-ending saga. As far as Chinese investment in India is concerned, it is far from satisfactory. For instance, last year’s figure of Chinese investment in India stood at just $1.1 billion. One expected positive development from Xi’s visit is most likely to be the announcement of investment of around $7 billion for the setting up of Chinese industrial parks in western India. While it is clear that the border issue would not be reaching a solution anytime soon, not at least this year, more confidence building measures might be proposed from the Chinese side. It has been observed in the recent past that there have been cobwebs of apprehensions between India and China and now it is time the two countries got away from the haze of rhetoric and stale euphoria. The two countries need to reinforce their relations at the bilateral level. Emerging dynamics should be understood and new lens should be put on. Even if the border issue remains unresolved, there should be a sense of understanding of each other’s concerns. In this context, it is imperative that India and China get out of the business as usual approach and reset their relations. Sana Hashmi is an associate fellow at the Centre for Air Power Studies, New Delhi. Xi's India visit: Can Modi play his cards well? How will Modi factor Japan in his China policy?